Expectations for Tech volleyball were relatively low when the season began. Though senior Gabriela Stavnetchei was named to the 2017 Preseason All-ACC team, the team itself was predicted to finish ninth within the conference, a rather low mark. Yet the team has more than met those expectations in the early goings. Their primary advantage has been leadership, both on the court and from the bench. Michelle Collier is taking charge of the Jackets for a fourth year as head coach, while Stavnetchei and fellow seniors Sydney Wilson, Gabby Benda, and Ashley Askin serve as leaders to a large freshmen class. Additionally, the team brought on Claudio Pinheiro over the offseason as an assistant coach. As a competitor, he is the owner of two gold medals with the Brazilian national team, while serving as its coach, an impressive resume. The Jackets opened the season with two hard fought battles against Auburn and Furman, both of which ended in disappointment. However, Stavnetchei was able to record a career-high of 11 kills during the Auburn game, while four freshmen (Alessia Del Romano, Cori Clifton, Sam Knapp and Nicole Alford) were able to experience their first college competition. The Furman matchup saw sophomore Kodie Comby record a career high of 15 kills, while Stavnetchei posted her first double-double of the season with 14 kills and 16 digs. Although the first two games did not have the outcome desired, players showed resilience and the ability to keep at it when the going got tough. The first win of the season came against No. 17 Michigan State at the end of August, which was Coach Collier’s first career win over a top-25 opponent, as well as the Jackets’ first win over a top-25 opponent since 2013. Once again, Stavnetchei stood out with another double-double, alongside the other senior women who competed aggressively against the Big 10 team. The team certainly desires that the outcome of that game represents a sign of things to come. Perhaps the most remarkable match so far this season was a 3-0 sweep against North Dakota, who had been undefeated until playing the Jackets. The match saw Stavnetchei and the seniors put up great stats again, yet it was freshman Sam Knapp who was able to start the ball rolling for the victory off of a serve that led to a crucial 7-0 run. The last two matches of August turned the 0-2 start to the season upside down, giving the Jackets the opportunity to bounce back from two tough losses. Freshmen Clifton, Alford and Knapp were able to create names for themselves throughout the first month as the team built upon the momentum from each game. At the beginning of September, the women traveled to San Diego to compete in the USD Tournament, but fell short of their own expectations with losses to San Diego, Texas and Villanova. But the Jackets bounced back with their return to Atlanta, starting off the Georgia Tech Invitational with a win over Xavier. Tech finished with a season-high .273 attack percentage after the Xavier game, while freshman Nicole Alford recorded a career-high 18 assists and Stavnetchei surpassed 100 kills overall, marking a team-high. Stavnetchei and Askin led the team to another win against North Florida, while Sydney Wilson and Kodie Comby assisted the Jackets’ sweep. The Georgia Tech Invitational allowed for a phenomenal comeback, giving the team’s home record an improvement to 5-2. Most recently, the Jackets fell to UGA in Athens, yet came back to sweep Clemson in the ACC Opener. The team was initially led by Grace Rigsbee, who marked a career high in kills, as well as Lauren Frerking, who tied her number of career highs. 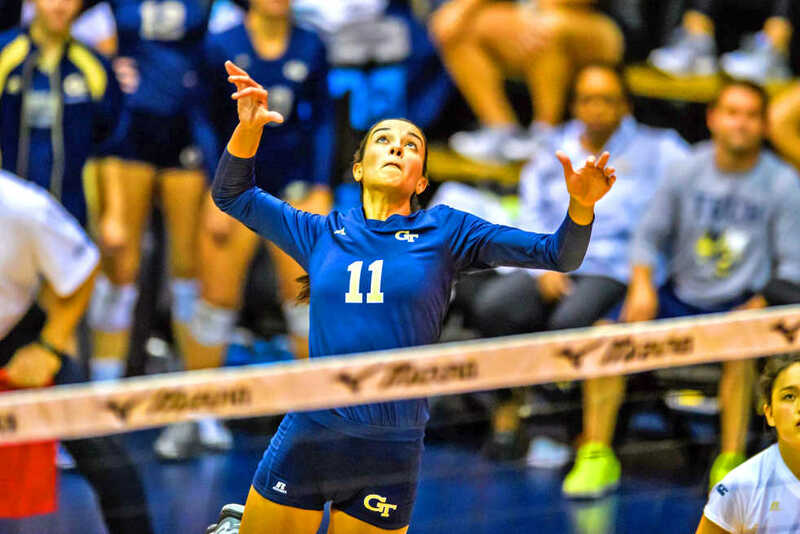 Still on the road, the Jackets traveled to compete against the Blue Devils where they were unable to repeat their victory; however, Frerking was able to once again tie her best number of kills, and Del Romano recorded her first career kill. Tech volleyball’s 6-7 start is not particularly impressive, especially for a team that won 24 matches last year. But with a large contingent of veteran players looking for one more chance at a conference championship before they graduate, there is no lack of urgency. With contributions from players all across the roster and steady counsel from experienced coaches, there is plenty of reason to expect an improvement.